Banana bread has always been a popular favorite, and there’s so many variations out there that it’s really fun to try in new ways. 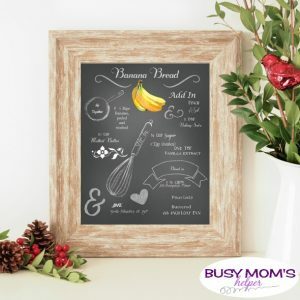 If you’re a fan, you’ll want to nab this Free Printable Banana Bread Recipe Chalkboard Art! Not only is a tasty classic recipe, but it’s also a cute display to print off and use as decor in your kitchen, or even as a fun gift for any occasion. Give it a try and see how delicious it is – plus how FUN! I’m a huge fan of the chalkboard design printables, and hope you’ll enjoy this as much as I do. Weekends are the time when we have the ‘better’ breakfast recipes – mostly because we have more time. 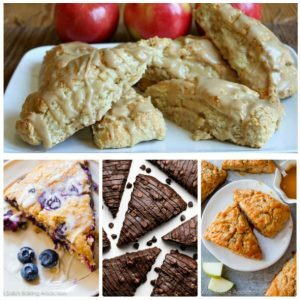 Whether you’re looking for something new to try for your Saturday, or an easy-yet-delicious option for a weekday morning, these Scone Recipes for Busy Moms are sure to please! I love a good scone recipe, but use to just think of honey or jam to go with them. Now that we’ve branched out more with our search for a wider breakfast variety, I’m a HUGE fan because there’s so many to choose from! Hubby is all over the pumpkin scones (of course) while I can’t wait to try the chocolate chip cream cheese ones. I know the chocolate chunk orange scones would be a big hit with the kiddos – so there’s something for everyone in this list of great scone recipes for busy moms! I know I just did a recipe using refrigerated crescents/biscuits the other day with these Super Quick Beignets, but they’re just SO HELPFUL when you’re trying to make something in a hurry! Seriously, I keep some packages stocked in my fridge at all times. At the moment there are……12 packs! Yup, that’s about normal here! 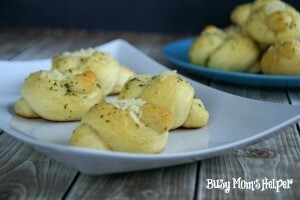 I love baking up these Garlic Parmesan Knots often because they’re so quick and easy. Plus, delicious! Serve them along with some spaghetti or red-sauced penne pasta. Or, just a flavorful side roll! And read on to find another variation I do that is super sweet and tasty! Preheat oven to 400 Degrees F. Spray two cookie sheets; set aside. Take the Crescent Rolls/Biscuits and roll into a long, skinny rope. Tie the rope into a knot, sticking the ends into the ball. Place the knots onto the prepared cookie sheets and bake for 8-10 minutes, or until golden brown. Make sure the middles aren’t doughy/uncooked. Mix the remaining ingredients in a bowl, then brush onto the knots while they’re still warm. Notes: Makes about 20 knots, depending on the size of the rolls/biscuits package you choose. Guys, it’s FINALLY cooling down here in Texas and I’m thrilled because that means we can go outside more – without melting, at least. This means more picnics, barbecues, and get-togethers….and all of those mean tasty food! One great dish to whip up for a fun gathering outside is this delicious Habanero Cheesy Bread – super easy to make, and full of incredible flavor, it’s sure to be a huge hit for any occasion! If you’re a big fan of regular cheesy bread like I am, you’re going to be thrilled to give this recipe a try because the El Yucateco® sauce enhances the flavor, making it a definite winner in the tasty food category. For this batch, I used their El Yucateco® Green Chile Habanero sauce because I love the green chile flavor mixed with the cheesiness of the bread. Pure deliciousness! Plus – you could win awesome prizes that’ll help you discover new places! El Yucateco®’s ingredients come from Field to Bottle. It includes no artificial colors, but the same great taste that makes it the King of Flavor since 1968. I grabbed a few from Target – so be sure to stock up next time you’re there running errands. This cheesy bread recipe would be great to try the different flavors with, so don’t be scared to mix it up a bit to see how each kind accents the flavoring in a unique way. Maybe I’m dorky, but I love the bottles they come in – they’re so convenient, and you can easily throw it in your purse for on-the-go to your next outing! Preheat oven to 350 Degrees F. Spray or line a bread pan, set aside. Combine the first 8 ingredients (flour, baking powder, sugar, salt, cream cheese, milk, vegetable oil & El Yucateco® sauce) and mix until well-combined and a dough forms. If too sticky, add a little more flour until it’s a nice, doughy consistency. Scrape dough into bread pan and bake about 40-50 minutes, or until cooked through. Remove and CAREFULLY (will be very hot) cut a checkered pattern on the top. Mix the cheese and butter (you can add a little El Yucateco® sauce if desired), then stuff all over the top of the bread and into the cut parts. Cover with foil and bake about 15 more minutes, or until cheese is melted. Allow to cool, then enjoy on your next adventure! I’m eager to try this with other flavors to see how the taste changes, and to find out which is my favorite! Check out all that cheesy goodness! Be sure to grab some El Yucateco® sauce the next time you’re at Target so you can whip up this amazing Habanero Cheesy Bread for your next outdoor party or gathering. What flavor El Yucateco® sauce would YOU use in this recipe? I’m in Utah visiting my relatives right now, and one thing we’ve enjoyed together is picking fresh berries from my sister’s garden. The kids absolutely LOVE it! 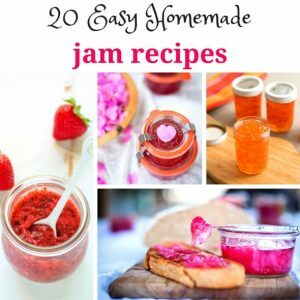 We plan to make some freezer jam this week with her tasty raspberries, so I thought it’d be great fun to share 20 Easy Homemade Jam Recipes so you can whip some up for yourself! Some of the recipes can probably be switched up depending on which product you have available, others may have to wait until a certain type is in season. Either way, there’s plenty of delicious jam recipes to choose from in this list! What flavor jam is YOUR favorite? Can I just vent for a minute guys? The past month has been INSANELY busy – more so than the normal holiday-type of busy. Between the regular holiday stuff with parties, school projects, work and pending Christmas break, we’ve also gotten further in our adoption process and hopefully in the next few weeks will be adding 3 kiddos to our family, becoming a family of NINE! Yup, busy. Luckily, we have some tasty Freschetta pizza stocked up in the freezer that we can easily put in the oven, then whip up these Sweet ‘N Spicy Breasticks for a delicious – and easy – dinner! Since our family has varying tastes, we make sure to have a variety of the yummy flavors offered, like Freschetta Naturally Rising Canadian Bacon and Pineapple or the Freschetta Naturally Rising Pepperoni Pizza. We also always have some Freschetta Naturally Rising 4-Cheese Pizza on-hand for those who like their toppings simple-yet-tasty. Don’t forget to use this awesome Savings Offer HERE and stock up the next time you’re at Walmart to make those extra busy nights a bit easier! I’ve always loved the undeniably better choice in frozen pizza for when you need a good dinner in a hurry. It’s freshness you can taste, and everyone in our family loves it – I’m certainly grateful for something quick that pleases our whole, big family. They rise naturally because of the perfect blend of 3 grains kneaded and rolled for the dough. And my fellow tomato-lovers will appreciate that the sauce is made using 4 vine-ripened tomatoes. All of that, mixed with 100% REAL provolone and mozzarella cheeses makes for one great meal! 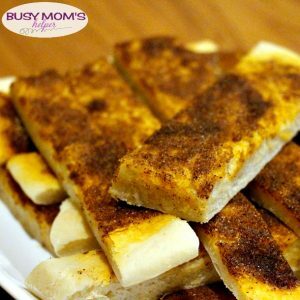 Now you just need to add an amazing side to go along with it – like these delish Sweet ‘N Spicy Breadsticks! Spread cornmeal on a baking sheet or pizza pan, or just spray it well. Once the dough is ready and risen, roll it out round (or square) to about the thickness of a regular pizza crust, maybe 3/4-1 inch. Place on prepared baking pan. Preheat oven to 350 Degrees F.
Combine the ingredients together, adding more or less olive oil until it’s moist enough to be spreadable. Use a basting brush (or spatula, whatever you have) to spread it around almost to the edges. Bake for about 12-18 minutes, depending on how cooked you want it. I typically do 15 in my oven for cooked-yet-soft breadsticks. Cut and enjoy warm with your pizza! You can always adjust the amount of chili powder you put in to increase or decrease the level of spiciness. I did the 1 tbsp, and it was just right for the kids – a little kick to it, but still mild and sweet enough that they were asking for seconds! And thirds, and…well, you get the idea. I’m hoping to get a bit more on top of my schedule by the holiday break (which is fast approaching!) so I can more fully enjoy my family time, especially with everyone bonding when our new kids join in. I’m so glad dinner isn’t one of the things for me to stress about as I’m getting it all done! Don’t forget the special coupon offer HERE! I’m a sucker for a good roll! They go along with so many dishes, and they’re just so…deliciously satisfying. I especially love how these Cake Mix Rolls have not only the perfect, soft texture like a roll should, but they also aren’t really sweet, so you can serve them alongside anything! Originally shared a few years ago, but resharing since this is a perfect dinner roll recipe for Thanksgiving, Christmas or any meal! 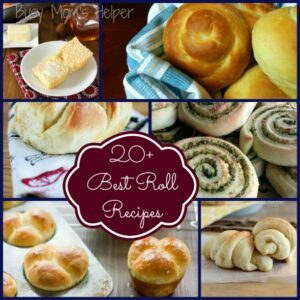 Note: originally shared this amazing roll recipe in May 2013. No text except this blurb have been changed from the original posting. This is our current situation: we just moved here in January, and are building a house. While that’s happening, we’re living in a small apartment with a one-person-only-or-your-bumping-each-other kitchen. As such, we don’t have visitors/family over very often. Or at all, I guess! My wonderful uncle and aunt, that don’t live terribly far (and on the same street our house is being built on), who live closer to our church building, have made it a habit of inviting us over for dinner after church on Sundays. I can’t tell you how WONDERFUL this is!!! I not only love it because 1. we get to see them and spend time (they have a new baby about 4 months old, and she’s so cute!) and 2. we don’t have to wait longer to eat dinner, but also 3. I get to try out fun new things to bring to go along with dinner, whether a side dish or dessert. LOVE IT!!! We were having chicken enchiladas one week, and I decided that some rolls would be a great accompaniment. Problem was, I’d never made rolls in my life! 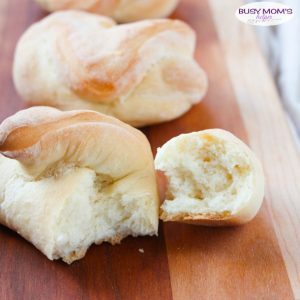 I found this amazing recipe on Sugar N’ Spice Gals, and automatically thought ‘Rolls with cake mix…..who could resist that? !’ They turned out so delicious, there was a small discussion over who got the last roll (Wonder Woman ended up with it, I think because she did the cute guilty look thing)! In a large bowl, mix the yeast into the warm water and let it stand about 10 minutes. Add the flour and cake mix and mix until well combined. Spread some flour on a counter or board, then knead the dough until no longer sticky. Add more flour if necessary. Lightly oil a large bowl, and place the dough ball in. Roll it around until all sides are covered with oil. Cover with a wet towel (paper towel is fine) and let rise for about an hour, or until it’s double in size. Place on board and roll into a large rectangle. (I realized our rolling pin was still packed away in storage, but made it work with a cup). Cut rectangles into about 2″ x 4″ pieces. Brush each piece with butter, then roll up short end to short end. Pinch the seam to help it stay closed, then place seam-side down on sprayed baking sheet. Cover with a wet towel (again, paper towels work great) and let rise for about 30 minutes, or until double in size. Preheat oven to 350 Degrees. Bake for about 15 minutes, or until lightly browned. Brush tops with more butter and ENJOY!!! It’s fall and you know what that means? Yes pumpkin everything! I love pumpkin but not till recently had I ever tried making bread and especially never thought to make pumpkin bread with cream cheese. 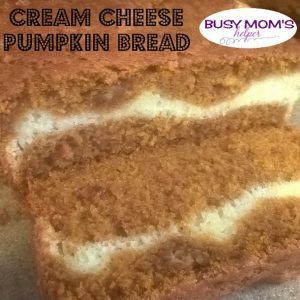 I now have a new favorite pumpkin recipe of Cream Cheese Pumpkin Bread that is a complete melt in your mouth fall favorite recipe that makes a perfect dessert or even a nice breakfast. 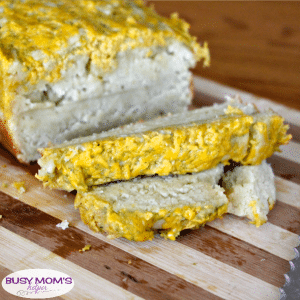 Cream Cheese Pumpkin Bread is incredible bread that will be perfect for any dinner, dessert, or even a quick grab and go breakfast, and it is pretty simple to make. With the recipe it only makes one loaf but I hate putting a partial can of pumpkin in the fridge, well I bought the big can that was 29 ounces, anyways so I ended up tripling the recipe, made three loafs but kept the bread mix in three separate bowls so it was easy to split into the bread pans. If you are good at measuring things out you can triple it in one bowl, make just a single loaf, whatever fits your needs. Preheat oven to 350. Spray a bread loaf pan with non-stick spray and then dust it with flour, the flour makes it a lot easier to get the bread out of the pan. For the bread, mix the first 10 ingredients well in a large bowl. Add in the flour, baking powder, and baking soda, gently stir in just until combined; don’t overmix. Pour about 2/3 of the batter into the prepared pan spreading it smooth and pushing it into the corners. Set aside. For the cream cheese filling put all ingredients into a mixer and cream until nice and fluffy, usually about five minutes. Evenly pour the cream cheese filling mixture over the bread, be careful not to push the filling into the pumpkin mixture but getting it to all the edges. Top the cream cheese layer with the remaining pumpkin batter, smoothing the top without pushing it into the cream cheese layer and again still covering the cream cheese getting the pumpkin mix to all edges. Bake for about 50 minutes or until the bread slightly starts to pull away from the edges. Allow the bread to slightly cool in the pan, then gently run a spatula along the edges and turn over onto a wire rack to finish cooling. Enjoy! It’s been awhile since we’ve done a Tried & True Recipe, so let’s give this Pumpkin Banana Chocolate Chip Bread a try! Super easy to make, delicious and super moist. As with all of our tried & true recipes, we’re just sharing our experience using another fabulous blogger’s recipe. To get the recipe and instructions, head to the post at Running to the Kitchen. We love her many fantastic recipes, from tasty desserts to yummy dinners. When I saw this one, I just HAD to give it a try – and of course it was every bit as delicious as I’d hoped! The only twist I’d maybe do to her recipe is to add some Pumpkin Spice to it – for a little bit more pumpkin goodness. But that’s just me…we’re major fans of all things pumpkin, so want us much of the flavor as we can get! I did make one loaf without chocolate chips, since hubby isn’t a chocolate fan (I know, crazy, right?!) and he agreed that everything from the texture, to the flavor combos was perfect – just needs a bit of pumpkin spice. 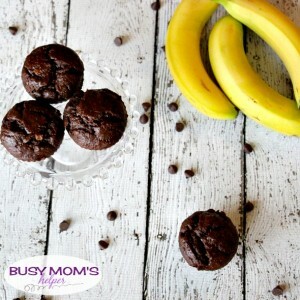 This is a tried and true recipe that definitely passed our test! 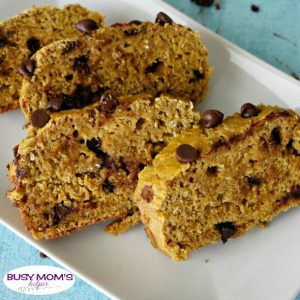 Head over to Running to the Kitchen for this pumpkin banana chocolate chip bread recipe – or check out all her other amazing creations on her home page! Does anyone else get a bit giddy when they see strawberries for a good price at the grocery store? I LOVE it, and so does my family – they’re one of our absolute favorite fruits! I grabbed several packs of the juicy berries so we could try a few new recipes with them, like this delicious and creamy Strawberry Honey Butter recipe! While I probably shouldn’t, it’s so good I could eat it straight out of the bowl. Don’t worry, I haven’t. At least not yet! Another thing on sale were bags of frozen rolls, so we grabbed some of those. We usually just enjoy honey or this blackberry cream cheese spread on them, but I decided to give honey butter a try, with a flavorful twist. I was thrilled that it turned out so good, and even the kids were licking their fingers. Another bonus? It only takes a handful of ingredients, most of which you probably already have on-hand. Score! Measure all of your ingredients into a stand mixer (or mixing bowl using beaters, if you must) and use the whisk attachment to whisk all of the ingredients well. Every so often turn it off, scrape the sides of the bowl, then let it run again. Whisk for about 4-5 minutes, or until it goes from clumpy, to smoother, to creamy. Store in an air-tight container in the fridge. For easier spreading, get it out about 20-30 minutes before serving to soften. Don’t panic if it takes several minutes to not be clumpy – I started to worry when it was just a glump of a mess in the mixer at first. After a few minutes, though, it got more smooth and ended up being perfectly creamy and spreadable. The small strawberry bits will mostly just blend in to the butter mixture, but a few dots will still show up – making this not only a delicious honey butter recipe, but also pretty! 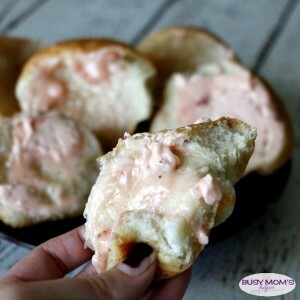 Check out all the strawberry buttery goodness melting on the soft, hot rolls! Yes, I snuck one while doing pictures – okay, maybe two – but it was so yummy I couldn’t resist! At least I didn’t just lick out the bowl, right?